ANNUAL RAINFALL: Varies from 12–20 in. (300–500 mm) in north to 40–60 in. (1,000–1,500 mm) in south. GOVERNMENT: Independence from France, 1960. Republic with president elected by universal suffrage. Governing bodies: Assemblee Nationale (legislative body), elected by universal suffrage; Council of Ministers, appointed by prime minister. The West African country of Senegal is one of the few nations in Africa that has enjoyed relatively stable and democratic government since independence. In recent years, however, the nation has faced economic difficulties and an ongoing threat of rebellion in its southern region. These problems have severely tested the strength of Senegalese democracy. Located on Africa’s Atlantic coast, Senegal is dominated by a series of rivers that cut through its rolling plains. The mighty Senegal River forms the country’s northern border, and the Gambia River flows through the southern region. Although Senegal has no real mountains, the foothills of GUINEA’s Futa Jallon mountains extend into southeastern part of the country. The nation is bordered on the north by MAURITANIA, on the east by MALI, and on the south by Guinea and GUINEA-BISSAU. The tiny nation of the GAMBIA juts into southern Senegal along the Gambia River, largely separating the southern province of Casamance from the rest of Senegal. Senegal’s climate is warm and dry in the north, but it grows hotter and wetter as one travels south. Vegetation is thin in the far north, where each year the SAHARA DESERT expands southward a few more miles. The barren north gives way to savanna in the central part of the country, while the more tropical southern region contains mangrove swamps. 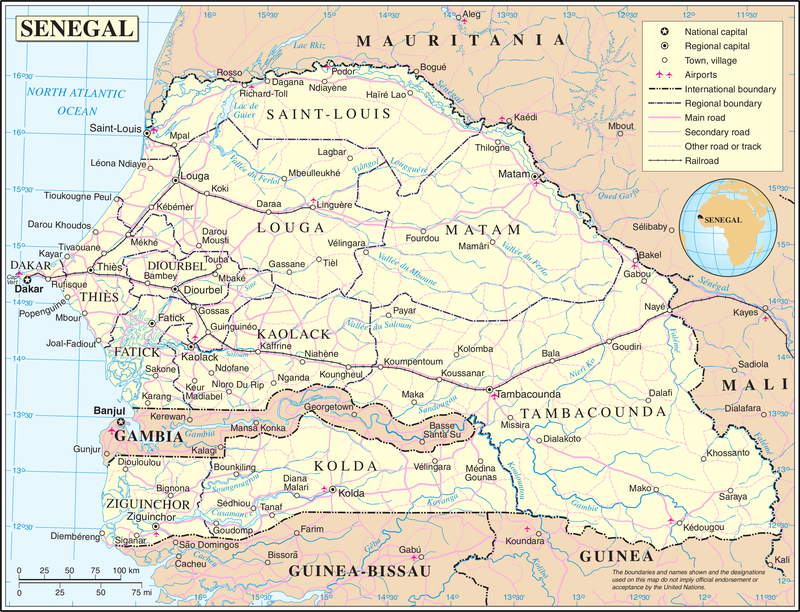 Before the colonial era Senegal was part of a fragmented geographical region that we know today as Senegambia. Located at the crossroads of several cultural traditions and containing diverse groups of people, Senegambia remained a backwater until the 1400s. Developments of the following centuries still have a profound effect on the political atmosphere of modern Senegal. In the 1400s Senegambia saw the rise of various kingdoms that drew their power from control of major rivers. Trade, mostly focused on the great trade routes across the Sahara, enriched the peoples of the interior. The arrival of Portuguese merchants about 1500 led to a redirection of trade to the coast. New kingdoms also arose along the coast, taking advantage of the Atlantic commerce in gold and ivory. Later slaves emerged as the most important part of trade. The growth of the SLAVE TRADE hastened the decline of the trans-Saharan trade routes. It also increased violence within the region, as rulers raided neighboring lands—as well as one another—to acquire slaves. This led to a centralization of power and to popular uprisings led by Muslim leaders known as marabouts. Nasr al-Din, one of these leaders, controlled the Senegal River valley from 1673 to 1677, when an alliance of kingdoms defeated him. By the late 1600s the remaining marabout leaders had established their own kingdoms in Senegambia. Although they protected their citizens from the slave trade, they continued to draw power from the sale of slaves and arms. The area remained divided into many small states that existed in an almost perpetual state of war against one another to capture slaves. The Portuguese trade monopoly in the Senegambia region was eventually broken by the arrival of other groups of Europeans, who divided the coastal region into areas of Dutch, English, and French influence. In the 1800s France and Britain emerged as the main powers in the region. France worked to gain control over the area surrounding the Senegal River, while Britain concentrated on the Gambia River region. Along with Portugal, both nations established forts on offshore islands and seized control over trade from the coastal kingdoms. The forts also enabled Europeans to take over the areas that produced groundnuts, the crop that became the basis of the region’s colonial economy after the slave trade ended in the early 1800s. While Europeans attempted to dominate Senegambia, the region was troubled by internal tensions. African rulers in the north struggled to maintain control over their rural subjects, while militant Islamic forces overran parts of the interior. In the mid-1800s the marabouts launched a series of jihads, or holy wars, but this new movement was eventually put down by African rulers loyal to the European colonial powers. The end of these jihads eliminated one threat to local rulers, but a new danger soon appeared—growing conflict with the European colonizers. In time France gained control over most of the region of present-day Senegal, while Britain held power over a narrow strip along the Gambia River. The Europeans faced a complex political and social environment in Senegambia. Most of the region was under the rule of local monarchs who dominated towns and cities but had less influence in rural areas, where the marabout movement had its greatest support. In addition, a number of societies also existed on the edges of the region. When the French established the colony of Senegal, they divided indigenous peoples of the region into subjects and citizens. The vast majority of Africans lived in agricultural areas where groundnuts were grown. Although classified as French subjects, these people had limited political rights and were restricted to territorial zones overseen by traditional chiefs. By contrast, the Africans of Dakar and certain other urban market areas were considered French citizens and were represented by a deputy in the parliament in Paris. When Muslim marabout leaders emerged as Senegal’s major groundnut producers, they replaced local chiefs as heads of territorial zones. The French incorporated the marabouts into colonial administration by giving them visible roles in public celebrations and having them serve as official representatives at Muslim religious ceremonies. Identified in this way with colonial power, the marabouts became the main link between the colonial government and the rural populations. Outside of the groundnut-growing areas, however, it was not easy to identify local leaders to bring into the colonial administration. This resulted in a lack of control over remote areas, which developed without a sense of allegiance to a central government. Senegal won its independence from France in 1960, but many of the old political problems remained. Those who controlled groundnut production still exercised the most power and authority, and many rural populations continued to be outside the mainstream of political life. The political system was still based largely on patronage, with powerful leaders exercising authority over and providing for the needs of weaker clients. Before independence the most powerful political parties in Senegal were the SFIO (the “Reds”) and the BDS (the “Greens”). The rivalry between these two parties dominated Senegalese political life from 1948 to 1958, when the two parties merged to form the UPS. A former leader of the Reds, Léopold Sédar SENGHOR, was chosen as the nation’s first president. Mamadou Dia, former Green leader, became prime minister. In 1962 Dia tried to seize control of the country. This attempted overthrow led to the adoption of a single-party system of government headed by a strong president. During the period that followed, Senegal practiced a form of socialism in which the state controlled the economy and was the main source of jobs and political power. Socialism played a central role in all areas of society as leaders attempted to unify the nation under a single banner. By the early 1970s, however, opposition to the so-called nationalist project was emerging, and groups that had resisted central authority in the past began to challenge the legitimacy of the government. The 1970s were a time of turmoil in Senegal. The economic effects of a drought that began early in the decade were increased by a sharp rise in oil prices and a dramatic decline in prices for Senegal’s principal exports, including groundnuts. At the same time, President Senghor agreed to an economic reform plan proposed by international lending agencies, including the International Monetary Fund (IMF), which called for reducing Senegal’s national debt and the number of government employees. The result was a steep downturn in the economy and a fiscal crisis. In the midst of these economic difficulties, Senghor embarked on a policy of political reform aimed at liberalizing the government. He allowed the formation of opposition political parties and strengthened the role of the prime minister. In 1980 the ailing Senghor resigned as president and was succeeded by Prime Minister Abdou Diouf. Senegal Since 1980. Economic reform and the presidency of Abdou Diouf launched what seemed to be a new chapter in Senegalese politics. As government resources declined, the old system of state patronage began to break down, and Diouf looked to a new generation of technical experts to fill government posts. Diouf was easily reelected in 1983, 1988, 1993, and 1996. However, the economy continued to struggle, and a new political challenge emerged from the Senegalese Democratic Party (PDS) led by Abdoulaye Wade. The elections of 1998 produced a close race for president, won again by Diouf. But the next election marked the end of his rule. A scandal erupted over the printing of a duplicate set of voter cards, and public outrage led to the election of Abdoulaye Wade as president in February 2000. Perhaps the most serious problem facing President Wade is the situation in Senegal’s southern province of Casamance. This region is a major source of groundnuts and contains rich FISHING areas off its coast. It also produces cotton for the nation’s textile industry and is growing in popularity as a tourist destination for Europeans. The people of Casamance, however, have seen little benefit from these activities. Since the mid-1980s the Movement of Democratic Forces of Casamance (MFDC) has been fighting for independence from the rest of Senegal. This separatist group is frustrated by economic problems related to the fishing industry and rice growing, and criticizes the lack of government spending on local infrastructure. For years Casamance’s rebels have received arms from the army of Guinea-Bissau. 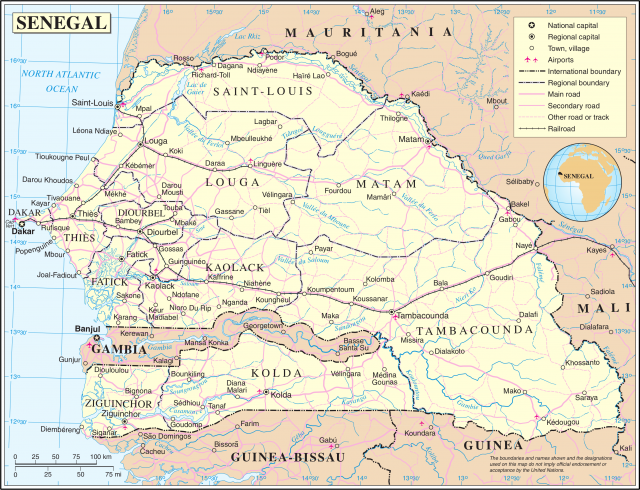 When Guinea-Bissau’s army rebelled against its president João Vieira in 1998, the Senegalese government supported Vieira. The uprising in Guinea-Bissau was put down with the help of Senegal and Guinea. But when the foreign troops left in 1999, the army rose again and overthrew Vieira. Relations between Senegal and Guinea-Bissau have deteriorated since that time. About 70 percent of Senegal’s population works in agriculture, with groundnuts being the most important export crop. Major food crops include rice and millet, and fishing and cattle-raising are also important economic activities. Despite the large number of people involved in farming, agricultural production is quite low. This is due partly to unreliable weather conditions, which can dramatically affect crop yields from year to year. Over half of Senegal’s gross domestic product (GDP) comes from trade, transportation, tourism, and service industries. These activities are helped by Senegal’s fairly well-developed transportation infrastructure, which includes a busy international airport and extensive road and rail connections. Many service and trade-related activities are performed on an informal basis, so their role in the economy is difficult to determine. Senegalese industry is focused on food processing, mining-based activities, textiles, and CRAFTS. The population of Senegal is very diverse, with the WOLOF being the largest ethnic and language group. About a third of Senegalese are of Wolof ancestry, and Wolof serves as the common language in both Senegal and the Gambia. However, because of Senegal’s ethnic diversity, social structure is perhaps the most appropriate way to categorize its people. Cultures in northern and eastern Senegal traditionally have been based on a hierarchical social structure consisting of nobles, free persons, occupational castes (such as blacksmiths), and slaves. Free persons were once mainly farmers, but in recent years many have moved to urban areas in search of other economic opportunities. Although this strict hierarchical social order has broken down in modern times, there is still little intermarriage between descendants of the different groups. Societies in southern Senegal historically have been less hierarchical and more suspicious of centralized power. Before the colonial era, government in the region came mainly through township councils and small groups of elders associated with various spirit shrines. Different clans controlled separate shrines, as did men and women on occasion. This type of system helped to avoid the accumulation of power into the hands of a few.